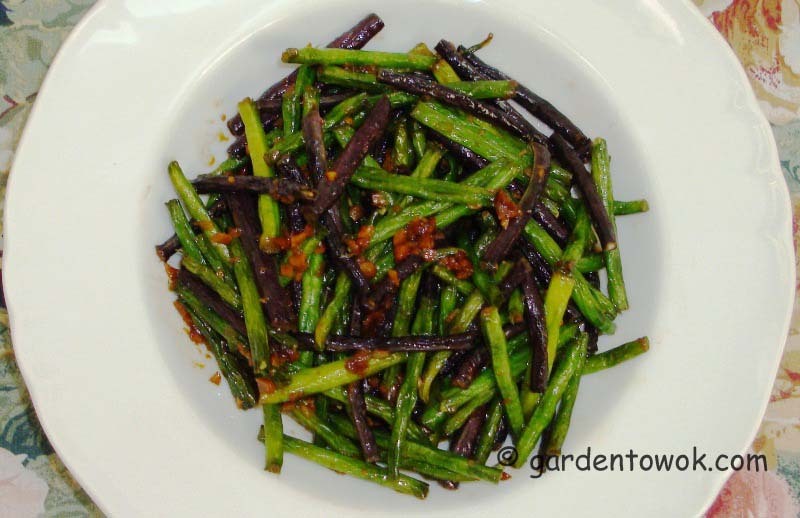 Chinese long beans, also known as yardlong beans, asparagus beans, snake beans, bora and long podded cowpeas, is a legume related to the cowpea and black-eye pea and native of Southeast Asia. Chinese long beans are grown for their tender long immature pods. There are many different varieties, with pod colors ranging from pale green to dark green, and seeds that are red or black. I grow the dark green variety with red seeds. This variety freezes well. There is also a red pod variety called red noodles (above photo). 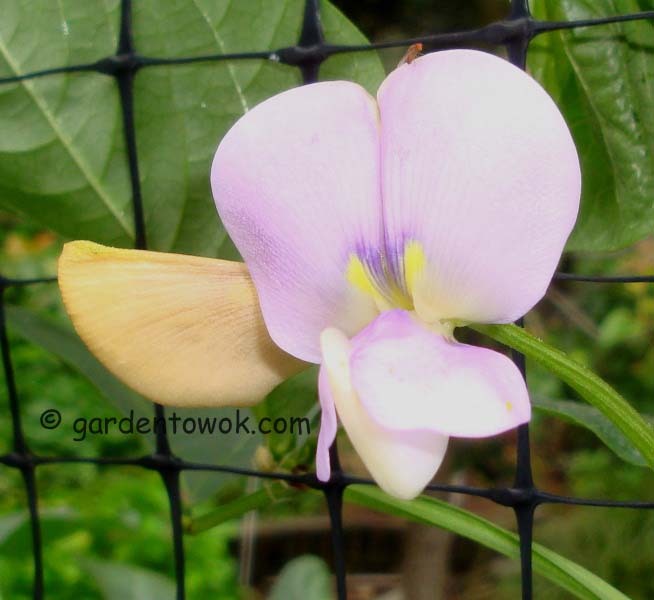 Right photo: Chinese long beans flower, the colors range from pale pink to violet-blue. I read somewhere that the flowers attract hummingbirds, I am keeping my eyes open. Growing: A warm season crop that thrives in heat and humidity (but very sensitive to cold temperatures). A vigorous climbing annual. Requires trellis or plant along a fence. My garden friend, Mary N, marysveggiegarden builds teepee trellises for her pole beans which will work for Chinese long beans also. For Mary’s step-by-step instructions click here. Mary uses branches and saplings found on her property to build her teepees. You can also use bamboo and other materials. Direct sow, ½ – 1 inch deep, 8 – 12 inches apart, in full sun, well drained light warm soil that is rich in organic matter, pH 5.5 – 6.8, or start indoors for transplanting when conditions are right. I start my seeds indoor beginning of May and transplant to the garden end of May. I not only get a head start, I also get better result because the soil is warm, and the plants do not suffer set back. I plant my seedlings along a fence. If you are using a teepee, plant seeds or seedlings around each post. Keep in mind your planting dates will be different than mine, check with your local cooperative extension or garden nursery for the appropriate planting dates for your specific location. Harvesting: Pick tender pods at 12 – 18 inches lengths and before the seeds swell. Pick frequently (the more you pick the more the plant produces), I allow a few pods to mature and turn brown. Harvest the browned pods. After drying, shell and save the seeds for the following year’s planting. Right photo: The pods grow in pairs on long slender stem. Notice how the seeds in the pods on the right are swollen. Still edible but the pods on the left are more tender and better tasting. ∞ Use as a substitute for green beans. ∞ Stir-fry, alone or combined with other veggies and/or meat. ∞ Leave them whole, toss with oil, salt and pepper to taste. Grill or roast in the oven. 1. Add oil to preheated wok or frying pan. Add garlic and onion. Stir-fry until onion is translucent. 2. Add beans. Stir fry until beans (the green ones) change color. Add wine, Stir fry until wine is absorbed. 3. Add soy sauce, salt and sugar, if using, stir fry until liquids are absorbed. Add 2 – 3 tablespoons water or broth. Cover and simmer for about 5 minutes (I like my beans crunchy), longer if you like a softer texture (you may need a bit more liquid), uncover and allow liquid to evaporate, beans will appear dry and wrinkled, with a chewy crunchy texture that I like. Serve hot or at room temperature. Add: ½ – 1 tablespoon fermented black beans, rinsed (See NOTE) at the same time as the garlic. Continue with, steps 2 and 3, recipe above. Add: 2 – 8 ounces coarse ground pork or other ground meat same time as the garlic and fermented black beans. Stir fry until pork changes color. Continue with, steps 2 and 3, recipe above. Add: additional liquid for gravy (optional) during step 3. NOTE: Fermented black beans also known as salted black beans or preserved beans are made from soy beans. They are dry to the touch and have a soft texture. Quite salty and taste like dried cured olives. Available at Asian market, specialty food markets and the international section of some supermarkets. 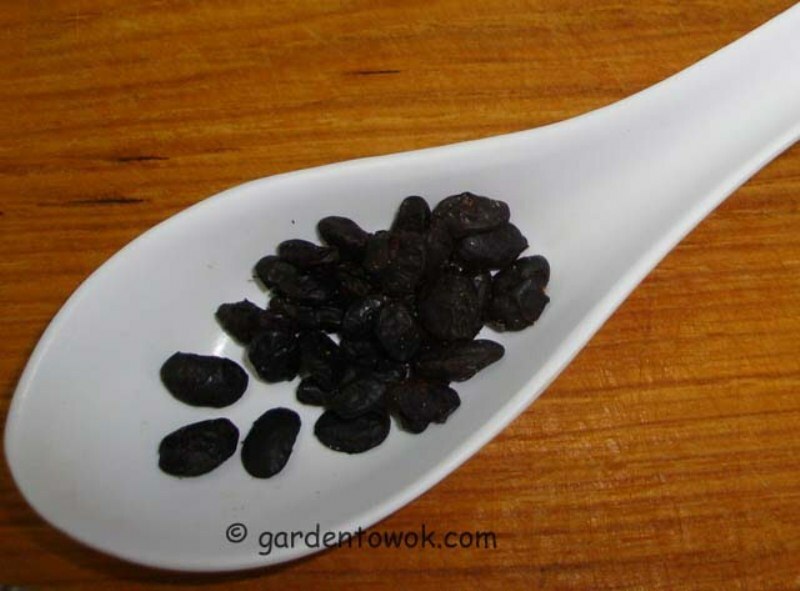 Substitute: 1 – 2 tablespoons black bean garlic sauce for the fermented black bean and garlic. Robin, The Gardener of Eden, is the host for Thursdays Kitchen Cupboard. Head on over to Thursday’s Kitchen Cupboard to see what others are cooking. This entry was posted in Gardening, Recipes, Vegetables and tagged asparagus beans, bora, Chinese fermented black beans, Chinese long beans, dairy free, gluten free, long podded cow peas, meatless, snake beans, vegan, vegetarian, yardlong beans. Bookmark the permalink. The purple ones keep their color when cooked? I know that regular green beans don’t. Yes, the red ones kept their color. They are called snake beans in Australia. Yes, they make great bean salad. Do you think you could recreate you Mother’s snake bean salad recipe? They are delicious especially freshly harvested from the garden. These look beautiful. 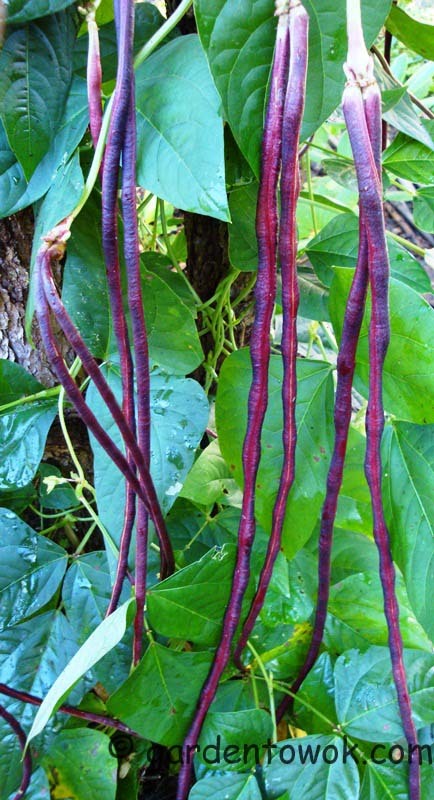 I’ve always wanted to grow red noodle long beans. Now that I know they keep their color, nothing can stop me! You will have fun growing them. I’m intrigued by those yard beans so have been trying to find out if they are obtainable and will grow in the UK. I’ve managed to find a specialist supplier and they will grow here with some care but they warn they will not grow very long in our climate!! Anyway it is on my seed list to try for next year now-thank you!! Glad to learn that the beans will grow in your area even it not very long. Could it be because you do not have hot and humid weather conditions? Did we grow any at Locust Grove this year? No, we are not growing them at Locust Grove this year. I always want to grow my own long beans because it’s very expensive here where I live. I’ve never seen red long beans before as it looks very pretty. Yes, the red long beans are very pretty. They are very easy to grow, worth the effort and garden space. How pretty these are with the purple and green together. I’ve seen these exotic beans in the grocery store but have hesitated making the purchase, thanks for the recipe and the lesson, Norma. For your links, may I suggest that you click “open in a new tab or window” so that it doesn’t overlap your post? You are welcome. Let me know if you decide to give the beans a try. I am very computer challenged. Could you give me step-by-step instruction on how to click “open in a new tab or window”? What do you mean by “so that it doesn’t overlap your post”? Thanks. Do you have a flower/ornamental bed? If yes, you could have a beautiful trellis in the back and plant the beans around each pole, they would make a lovely back drop. OK to interplant the red and green varieties. That just gave me an idea – thanks! I’ve decided to re-strategize my garden since the guava and banana trees have grown so big and throw off so much shade that I can’t get big summer annuals to grow there anymore. I just have to make sure the beans don’t “jump” off the trellis and climb up into the canopy of the guava tree like they did a couple years ago and I couldn’t get to them! You are welcome. You have guava and banana tree in your backyard? I am sooooo jealous. Thanks, Norma, for today’s lesson. I have seen these beans at the Asian markets but been completely clueless as to their preparation. Well, not anymore. I find bean salads make wonderful side dishes and using these beans would add a bit of variety, as well. You are welcome. Charlie (hotlyspiced.com) commented that her mother made snake bean (that’s what they call them in Australia) salad every Christmas to go with hot roast turkey. I will write her and see if she can put together her mother’s recipe. 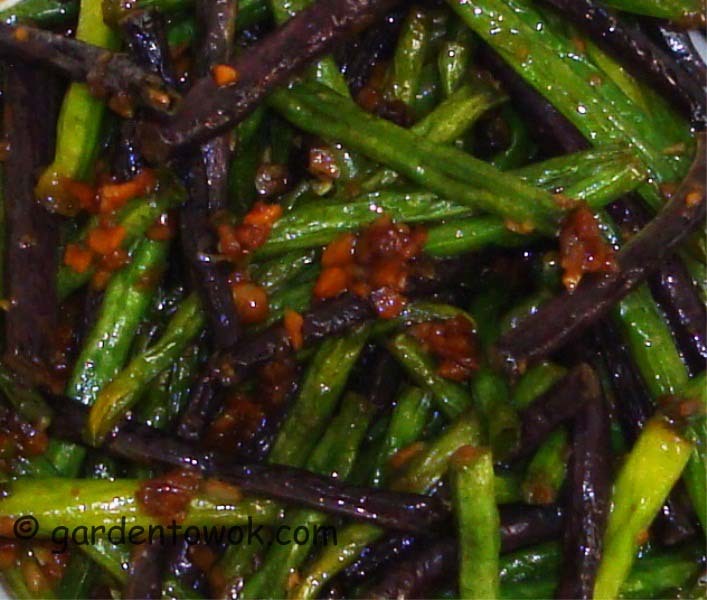 These stir fried long beans look great, and I’m glad to know that they are as versatile as a regular green bean. Someone gave me a handful once and I had no idea what to do with them. Love the idea of roasting them, too! Anything you can do with green beans you can do the same with these long beans. If you decide to roast them, leave them whole, they will make wonderful presentation. I should go and add that to the post. I love our yardlong beans. They are probably not familiar to a lot of gardeners, but they should be more popular. And they have kept right on producing in our heat wave, while the green beans gave up. I tried a bit of honey in my last stir fry, and it worked well. I’ll have to give maple syrup a try next time. Agree, these beans should be more popular. They are so easy to grow, and yes they are thriving in our heat wave. Besides stir fry, what are some other ways you use your beans? I like them raw in salads. I wonder if you could pickle them, like a green bean? I understand they can be pickled like green beans, I never tried. I’m going to have to try your recipe Norma. I’m sure it will be as wonderful as all of your other recipes! I read that you can also can them like you do green beans. I meant to say “pickle” the long beans like you do green beans. I wonder if I’ve ever eaten these before. I certainly haven’t ever bought them or cooked them myself, but they do look like some dishes I’ve seen at restaurants. I love the picture of the pods on the vine. The colors and sizes and shapes are so fun! I will try it, I’m very curios as I’ve never taste it before. Thank you for a great idea. You are welcome. Hope you give me feedback on how you used the beans. The long beans must look like a beautiful sculpture in your garden. They certainly are pretty on a plate. They are stunning hanging on the fence, both the green and red beans and their flowers. My mom used to make savoury rice with those long beans and shrimps. It was really delicious. Love your stir-fry too. Did your Mom use fresh shrimp or dried shrimp? I like the look of the purple beans against the green ones! I believe they will grow well where you are. “(but very sensitive to cold temperatures)” – I guess I won’t be growing these babies in Sweden one day then alas… apparently this summer is the coldest one since 1854 or something, with temperatures in some places down to -2 Celsius in the nights! These look absolutely wonderful though… do they differ in taste much from green beans? I can’t believe how long and thin they are! Huh! Last night the temperature here [Southern Highlands of NSW, Australia] also dropped to -2C, BUT it is kind’of midwinter here! I DO remember freezing in Stockholm in June 🙂 ! We are having heat wave. Gueess they would not do well in Sweden. You could try growing them on your balcony in Paris. They have a slightly pleasant earthy undertone. Well, I am one of your Australian readers for whom these have always been ‘snake beans’ : somehow we don’t seem to grow them quite as long in Oz, but they are my fave bean and not always available for purchase fresh and crunchy where I live. SO, thank you so much for teaching us exactly how to grow 🙂 ! Our spring sowing is about 4-6 weeks ahead – can’t wait, and, for the first time, shall try to grow these beautiful vegetables! Thanks! And, yup, I do grow such on teepees – so much easier to find and harvest 🙂 ! It could be the variety, some are a bit shorter others a bit longer. Looking forward to hearing about your experience and how they grow in your part of the world. I never heave seen these specila long beans before other then on your lovely blog & you have home grown them too! They look very lovely & tasty too! That recipe rocks! These beans look fabulous, Norma. I got some dry black beans from my Asian market to make Korean sweet black beans. They turned out pretty good. I noticed that the black beans were actually green under the black “skin”. Do you know these beans? Are they a different variety from the black beans used in Mexican cooking? Also if you have a recipe for Korean black bean I’d love to read it! The driy black beans you purchased may be black soy beans, hard for me to be positive without actually seeing the beans. The black beans used in Mexican cooking (I do not believe is black soy beans) is different. Welcome and thanks for visiting my blog. Norma, thanks for the detailed post on long beans. The once I made following your recipe were delicious! I am looking forward to the next farmer’s market to buy some more. I will definitely try to grow it! So glad you gave me feedback about my recipe and happy to know you found the result delicious. Did you get the green or the red variety?